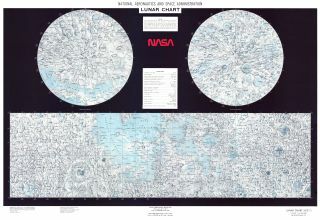 A lunar map produced by NASA in 1979 is one of more than 2,000 different planetary maps included in a new database. Maps are a key tool for making sense of places we live or hope to one day explore, so it's no wonder that for hundreds of years, humans have been creating maps of other worlds in our solar system. And more than 2,200 such maps, created over the course of four centuries, are now gathered on one website, unveiled at last week's European Planetary Science Congress held in Berlin. The website, called the Digital Museum of Planetary Mapping, allows you to browse images by the decade of their creation, the world they depict or the type of data the map displays. "We live in a transition period where static maps that characterized the last 400 years may become extinct, replaced by dynamic digital map services and tools," Henrik Hargitai, a planetary cartographer at Eötvös Loránd University in Budapest, Hungary, and one of the co-creators of the website, said in a statement. "In the digital platforms it is becoming difficult even to define what we consider to be a 'map,' and not just layers of spatial data," he said. Hargitai also said he was inspired by the sheer number of such maps and how hard they can be to find. Right now, the oldest map available on the website is a sketch made between 1600 and 1603 of the moon's surfaces, drawn without the aid of a telescope. That's a far cry from, for example, a 2011 map of the moon based on Lunar Reconnaissance Orbiter data. Earth boasts just one entry to date, an 1869 black-and-white drawing comparing Africa, Eurasia and Australia to Mars, and the moon and Mars are both particularly well-represented. But plenty of other worlds are featured as well, from fuzzy 1940s observations of Jupiter's four largest moons to a 2010 globe of Titan. The collection also highlights a range of different types of maps, including tactile maps and maps for children. A few entries also display additional images, like a series of photographs showing the construction of large globes of Mars using Mariner 9 data.